First published by OneWorld Publications in October 2014. Winner of the 2015 Man Booker prize. On 3 December 1976, just weeks before the general election and two days before Bob Marley was to play the Smile Jamaica Concert to ease political tensions, seven gunmen from West Kingston stormed his house with machine guns blazing. Marley survived and went on to perform at the free concert, but the next day he left the country, and didn’t return for two years. Not a lot was recorded about the fate of the seven gunmen, but much has been said, whispered and sung about in the streets of West Kingston, with information surfacing at odd times, only to sink into rumour and misinformation. Inspired by this near-mythic event, A Brief History of Seven Killings takes the form of an imagined oral biography, told by ghosts, witnesses, killers, members of parliament, drug dealers, conmen, beauty queens, FBI and CIA agents, reporters, journalists, and even Keith Richards' drug dealer. Marlon James’s bold undertaking traverses strange landscapes and shady characters, as motivations are examined — and questions asked — in this compelling novel of monumental scope and ambition. I really do need to stop reading Booker prize winners because I am so often underwhelmed by them after having high hopes and that is especially true of this book! 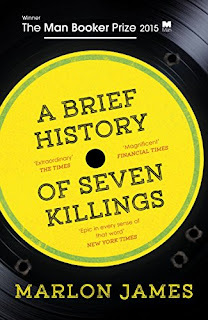 A Brief History Of Seven Killings is anything but brief so that had me a little intimidated before I even began, however I did give it a try and would say, for me, it was ok. I'm not sure this book really rewarded the hours I spent reading it though. The novel has several lead characters each of whom narrate their own chapters and I didn't feel that they all had distinct enough voices to warrant this so I kept losing track of whose story was being added to. Sometimes this mattered, sometimes it didn't. I felt the earlier sections actually set in Jamaica were stronger as there was more of a sense of purpose and structure. James doesn't move any scene forward quickly though which I found irritating. Even gun battles seemed so drawn out by repetitive dialogue that they lost dynamism. I would have liked more background and far less chat. There is a lot of macho posturing! I do think I have come away from reading A Brief History with more understanding of the political power-play in 1970s Jamaica. I don't know to what extent James' detail is true, but assume the overall picture to be fairly accurate as I understand significant research was done. It would be interesting now to read further factual books of the era.